JagatramNiwas was founded in 2003 by the brothers Bavinder and Mohinder Singh, together with their wives Rekha and Santosh Devi. 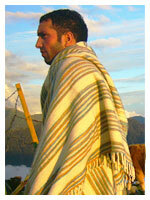 In 2007, they were joined by Matthew Singh Toor, who works as their reservations, marketing and development manager. 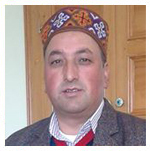 In addition to running JagatramNiwas, Bavinder has worked as a tour guide in and around Bhagsu, McLeodganj and Dharamsala. He has extensive knowledge of local sights and attractions and many years’ experience of arranging treks and other activities. A carpenter and builder by trade, Mohinder has constructed many buildings in the Dharamsala area, including the new Tibetan Parliament building. He also takes responsibility for the maintenance of the temple above Jagatram Niwas. Rekha and Santosh are also siblings. They undertake the day-to-day running of the guesthouse – cooking traditional Himachali meals and ensuring that Jagatram Niwas is always more than a ghar (house), but rather a home. 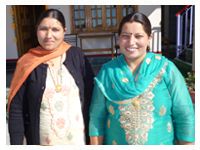 Rekha and Santosh hail from the nearby village of Naddi, near to Dal Lake – one of the area’s sightseeing attractions. Originally from England, Matthew now lives with the Singh family in Heini. 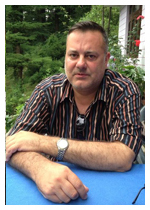 Matthew is also a writer and journalist and has worked closely with Dharamsala’s Tibetan community over the years.